A West Sacramento, California elected office holder said she was dismayed at the behavior displayed by Elk Grove, California Mayor Steve Ly and his companions during a recent vigil service. The comments, which were her own and not representative of the government agency she serves on, were made by Sarah Kirby-Gonzales, President of the Washington Unified School District Board of Trustees. The behavior, which Kirby-Gonzales characterized as inappropriate were at a candlelight vigil service for the three West Sacramento siblings who were killed, allegedly by their father. That candlelight vigil was held on Thursday, September 14, one day after the close-knit West Sacramento community was shocked by the deaths of the siblings. The vigil was held at Southport Elementary School, where two of the siblings attended. According to Kirby-Gonzalez, the inappropriate behavior by Ly and his two male companions started with their late arrival at the service. Arriving at the crowded event 30 minutes after it commenced, Ly and the two men made their way to the front of the audience. During a solemn moment in the service when members of the clergy were consoling the participants, Kirby-Gonzalez said she heard Ly. "I heard 'Hi, I'm Elk Grove Mayor' in the middle of this very quiet, somber moment and prayer," she said. "He made his way over to me, which is fine, and a man who came with him handed me a candle to light it, again in the middle of a very somber moment." Thinking Ly's companion was grieving, he instead handed the lit candle to Ly and he "started snapping pictures." Kirby-Gonzales said it took her a moment to process what happened but realized the two men who accompanied Ly were "his entourage." While this was happening, the two members of the Mayor's entourage, who are believed to be his two city-paid interns, Kirby-Gonzales said the associates opened a story on their phones for Ly to read. "I don't know what could be so important that he needed to read it" at this place and time she said. While the service was going on, Kirby-Gonzalez noted Ly's entourage were scrolling through their phones looking at pictures and memes. "I looked over because I was shocked at what they were doing," she said. Kirby-Gonzales said when it was an appropriate time she tapped Ly on the shoulder and queried him on the behavior of his associates. "'Did you just bring these men to stand here and play on their phones,'" she asked. Ly then turned to the two, and signaled them to stop their activities. "One of them looks at me very mad and said 'You could have just told me to turn off my cell,'" she said. In response, Kirby-Gonzalez said she told him "you are a grown man, I should not have to tell you how to act." After the service Kirby-Gonzalez identified herself to Ly "because I think he thought I should be impressed by his title" and advised him the vigil "is about a family, this is about grieving and was just disgusted by the [the entourage's] behavior." Noting the tragedy surrounding the circumstances of the vigil, Kirby-Gonzales said anyone who was grieving over the incident was welcome to participate in the services. "That was not was happening here," she said of Ly's associates. "The men continued to take pictures anytime he [Ly] hugged the family or any moment that happened that might be, essentially a photo op with him in it." Although there is no definite identification of the entourage, the two men are believed to be Ly's city-paid interns. Ly did not reply to an email request seeking comment. Although Ly and his four Elk Grove City Council colleagues are allotted 19-hours-per-week paid interns, he is currently the only one taking advantage of the program. While the Mayor and council members are given latitude in how they use the services of the interns, in the past, interns have been used as office assistants and by law, they cannot engage in activities which are deemed to be part of a campaign. Kirby-Gonzales, a fellow Democratic party member with Ly, said she thought if the two men were in fact Ly's interns, it was "an abuse" of taxpayer money. To cap it off, after talking to Ly, Kirby-Gonzales was speaking to a West Sacramento City Council Member and Ly "asked the council member to lunch." Kirby-Gonzales then said she moved away, but before doing so she expressed her dismay to Ly. "I told him 'I can't talk to you, I'm just too disgusted, but I appreciate you apologizing, but I have to remove myself from this situation,'" she stated. "But never in a million years would I imagine taxpayer money was funding those men to stand there with him." Mayor Ly deserves a pass because his father rescued downed American pilots in the Laos air war. Ly's pushing to the front of the line at the vigil and promising to be first in line at the casino buffet is ingrained into his psyche, because as he has stated many times, he escaped into Thailand as a child and hid out in a small bathroom for about a week. Well, when you and your family are stuffed into a small bathroom, when nature calls, you have to push and shove your way to the front immediately! Mayor Ly deserves a pass because he is the first Hmong mayor in the United States. Where he comes from, that is like royalty! Very important people have to record their events because historians will have a photo record for all future generations to enjoy when reading his biography. I don't know about you, but I get giddy just knowing that Mayor Ly is making history and putting Elk Grove on the map! EGN needs to show some respect for history in the making! None of what you say is a valid reason for acting as he does... absolutely NONE !!! It may be worth watching tomorrow night's Elk Grove City Council meeting. What may make it worth watching is to see not the reaction of Mayor Ly - there will be no mention - but rather his four colleagues. 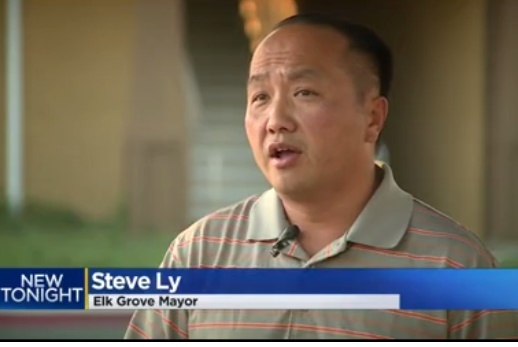 If memory serves me correctly, Mr. Detrick and Mr. Suen were very quick last year to censure Mr. Ly when he made what were perceived as derogatory comments about the Elk Grove Police Officers Association and their candidate endorsement process. While Mr. Ly was censured for that, will Mr. Detrick and Mr. Suen criticize their colleague during their individual update reports? If we are to believe the incident as Ms. Kirby-Gonzalez described it, Mr. Ly insulted something more significant that the Police Officers Association - he insulted the people of our city with his antics. I guess if they are unwilling to criticize abhorrent behavior and pro-Nazi comments from our President without prodding, they will lack the courage to to stand-up and address Mr. Ly to his face, and censure his poor behavior in West Sacramento. After all, as Mr. Ly said before the council doesn't need any interlopers and they need to preserve their "culture."